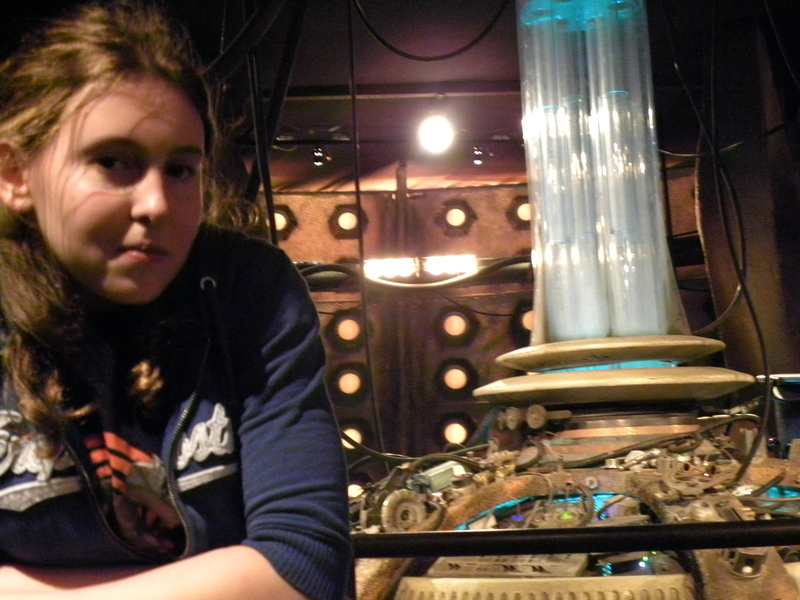 Doctor Who Experience | Damian Trasler's Secret Blog - Do Not Read! It’s been a long time since I’ve talked about emigrating. Long ago life settled down into a regular form, became just the ordinary every day. Yes, there are still times I marvel that we live in Canada, that I tell which direction I’m driving by seeing the mountains on the North Shore, but I don’t convert dollars into pounds any more, trying to see if things are cheaper or more expensive. I don’t flinch from saying “pants” instead of “trousers”, and I no longer think “parkade” is a fizzy drink. 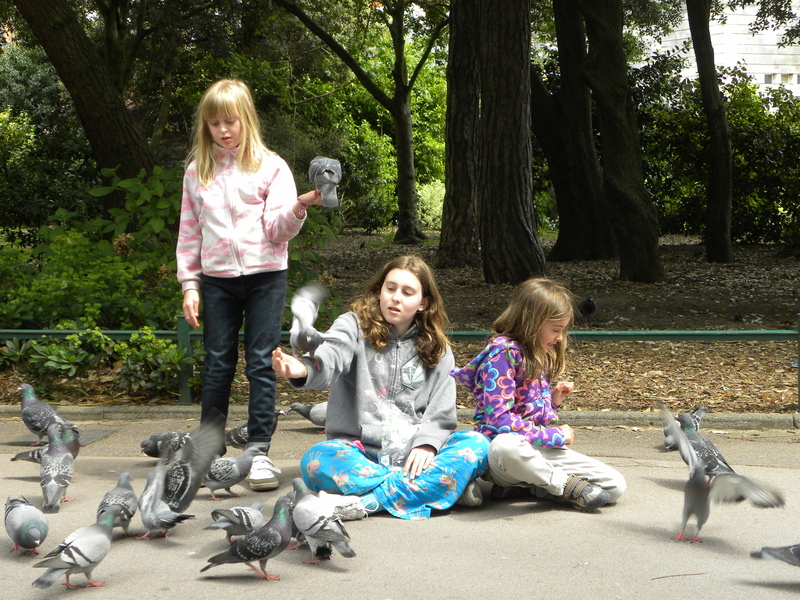 Soon we’ll head back to the UK for our second visit since we emigrated. This time we’ll be going back in the winter, with all the added unpredictability that brings. Will there be a sprinkling of snow that closes roads and railways? Having once shoveled my driveway clear three times in the same day, I’m inclined to roll my eyes at that thought. And we don’t get “real” snow here in the Vancouver area… Just ask someone from Winnipeg. Our last trip back was a summertime thing, and we met friends on the beach in Bournemouth. We walked through parks, in London and Worcester. When I think of going back, those are the images that come to mind. 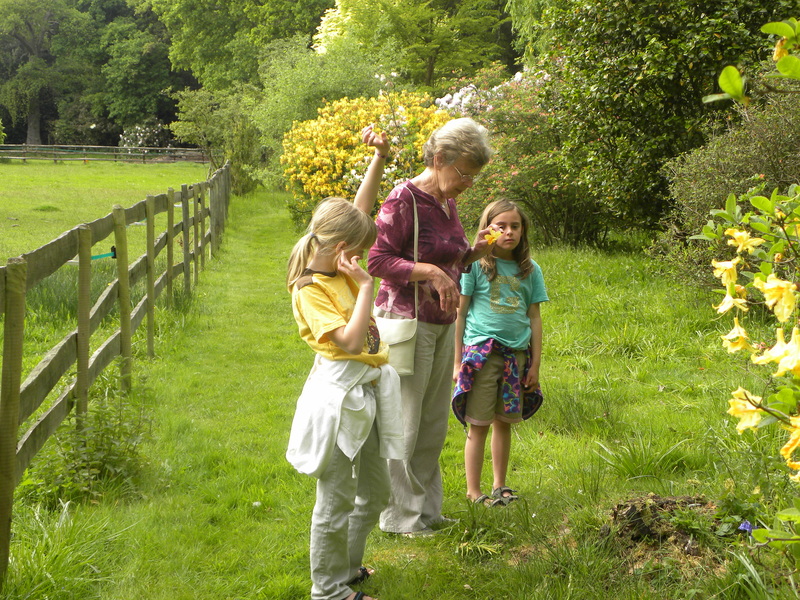 Younger Weasels and their Grandma in a very English garden. But we’ll be there for early nights, cold, brisk days. And probably rain. We’ll be spending almost every day going from one place to another so we can visit as many friends as possible, but we also have to set aside time so we can celebrate Christmas with the family we’ve been away from for so long. 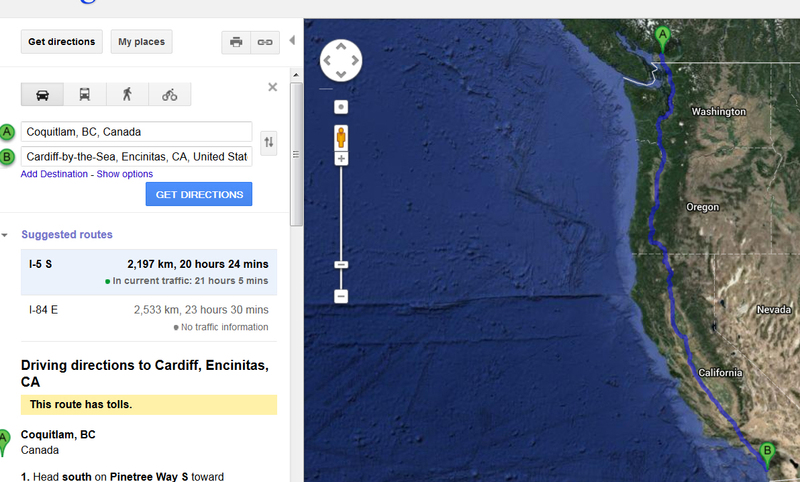 You can see (perhaps) that that journey is 2197 km. If you need a translation, that’s 1365.153 miles, or a trip from John O’Groats to Land’s End and more than halfway back again. We did the journey home again in three days. Four and a half years is quite a long time. It’s time for a child to be born and reach school age. It’s been time for one of our Weasels to reach High School and settle in. Middle Weasel is now in the top age group in her school. I’m on my third job, and am convinced the ancient curse has followed me to Canada (I worked for TVS – they lost their franchise. I worked for Peter Dominic’s – they went out of business. I worked at the Bell Hotel in Alresford – it looks like they did a good job of rebuilding it after the fire. Here in Canada I worked for Canpages and they went out of business.) But I’m happy in my library job and hope to stay with it for a long time to come. We’re going back to see our friends and family, and we’re only sorry we won’t be able to visit everyone in the time available. And of course, if it snows, we may not get out of the airport…. *There are certain factions within the family that maintain the ENTIRE reason for the visit is The Doctor Who Experience in Cardiff. If anyone from the BBC is reading this, we know the perfect person to co-ordinate a Doctor Who Exhibition in Vancouver – she already knows EVERYTHING about Doctor Who. Doctor Wheasel – TARDIS not included.